FabFilter now introduces FabFilter Pro-G: a top-quality gate/expander plug-in with flexible side chain routing options and a streamlined, well-designed user interface. Equipped with linear-phase oversampling, mid/side processing and precise metering, Pro-G is an indispensable addition to the FabFilter tool kit. 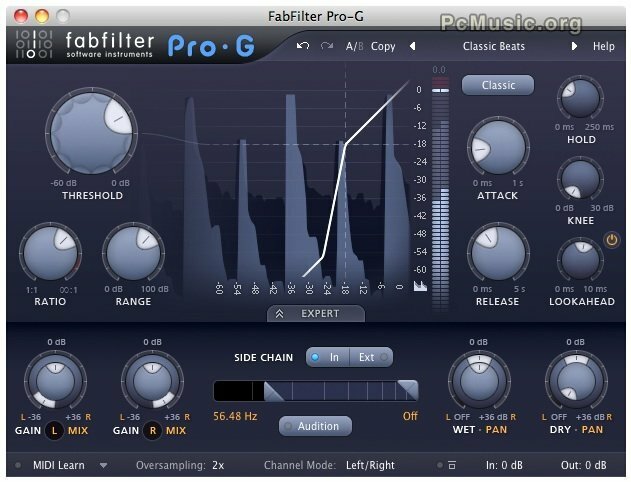 FabFilter Pro-G offers five meticulously fine-tuned algorithms, including classic analog models and upward expansion, as well as specific designs for vocal and guitar processing. In combination with the adjustable threshold, ratio, range settings and attack, release, hold and look-ahead times, Pro-G will process your drum and vocal tracks smoothly and with character. At the same time, Pro-G is also the perfect tool to subtly and precisely restore lost dynamics while mastering. Nov 30, 2012 All FabFilter Plug-ins Updated! Mar 7, 2012 FabFilter Saturn in orbit! Apr 21, 2009 FabFilter One for €5 !